The dreaded day has finally arrived. After sweating through another restless night of sleep, you roll out of bed in fear of one of the most common phobias that plague mankind. No, we’re not talking about rolling out of bed into the range of a lonely spider. We’re talking about glossophobia, a fancy term that describes the inexorable fear of speaking in front of an audience. Oh, the audience doesn’t have to number into the hundreds. You can experience glossophobia simply by getting up in front of a small group of your professional peers. Let’s gloss over this fear by taking five steps to beat it. You cannot conquer glossophobia by hoping that your nerves don’t dangle like live wires in front of a vast audience. Public speaking requires a baby step approach that begins by conquering your public speaking fear in front of smaller audiences. Ask a few friends and family members to sit down for a short presentation and increase your confidence by adding people to the small group. Familiar faces breed public speaking comfort and eventually, you should be able to address your professional peers flawlessly during a PowerPoint presentation. The Boy Scouts promote 12 mottos that hopefully mold the character of future leaders. No other Boy Scout motto has more relevance that “Be Prepared.” You can never expect to conquer glossophobia by winging it in front of large audience. The ability to communicate your talking points effectively relies on preparation. Not only do you have to rehearse your discourse several times, you also need to make sure you have researched the topic to enhance your credibility. Unless you’re the President of the United States reading from a teleprompter, you can expect a few missteps during any public speaking engagement. The key to addressing public speaking mistakes involves not running for the exit and defusing the tension by making fun of yourself. Yes, self-deprecation gores a long way towards building the level of credibility required for your audience to take you and your spoken words seriously. No one embraces a public speaker that believes she is the most recent incarnation of Tony Robbins. You can lie on a couch next to a shrink and try to delve into your glossophobia or simply follow a few simple tips to ease your public speaking angst. Most on top of their game athletes envision the outcome of their endeavors long before they take the field or court. Visualize positive public speaking outcomes in a quiet setting. No, you don’t have to burn incense and chant incessantly, but you do have to relax your mind before a big speech by implementing common mediation practices. You nail glossophobia right off the bat by engaging your audience. Create a speech that informs your audience, but more important, your words must entertain as well. Question and answer monologues quickly engage your audience and you don’t have to wait until the end of a dry monologue to ask for audience participation. By interacting with your audience from the start, you immediately expunge the fear of public speaking. The news that you are expected to stand up in front of a foreign audience and deliver a speech makes the fear of snakes seem innocuous. However, glossophobia should never cripple your career aspirations, especially when your career aspirations involve developing professional credibility in front of large crowds. 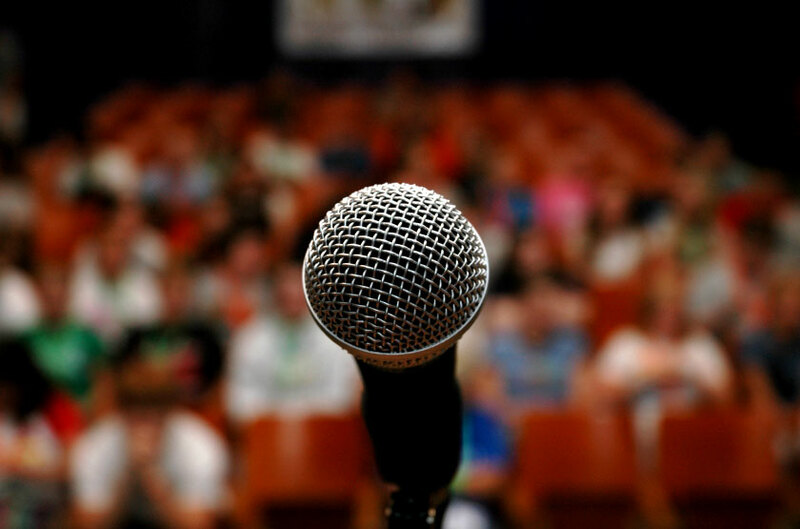 If all of the tips for eliminating glossophobia fail, there’s always one trick that helps you conquer the fear of public speaking and it’s not a snort of your favorite whiskey. Don’t aimlessly gaze out into the vast horde, but instead, connect with members of your audience by looking directly at as many members of your audience as possible.